If you can delight your customers the moment they reach your front door, you can turn them into lifelong advocates of your brand. This is why the position of the front desk attendant, concierge, and host is very significant. It establishes the first and most lasting impression your guests will have. With two-way radios in use, your front desk staff can more easily and effectively manage operations. Open tables and cleaned rooms can be instantly communicated, reducing customer wait time, and staff are able to be more attentive to guests’ needs. Maintenance personnel are crucial for keeping things running smoothly in a restaurant or hotel. Issues such as a spill or broken air conditioning unit need to be addressed and resolved as quickly as possible. Two-way radios save the day in these instances because they help streamline operations with work order ticket management systems. If a guest reports that a light bulb in their room isn’t working for example, the front desk can immediately issue an urgent work order ticket to the maintenance team using a two-way radio. Better coordination leads to a better overall experience for customers. A hotel’s housekeeping staff often has direct contact with guests, and their behavior also leaves an impression. On that account it’s necessary to equip housekeeping staff with two-way radios, so they can receive requests and respond in a professional manner. A well-stocked room is what guests expect when they visit a hotel, but it’s not uncommon for a guest to have to request more towels or even toilet paper during their stay. In these situations, housekeeping staff need to be on call at all times with their two-way radios, ready to go above and beyond accommodating guests. It’s extremely vital for hospitality establishments to create a safe and comfortable environment for customers throughout their property. They can do this by equipping their security team with two-way radios for instant and discreet communication. Two-way radios improve guest safety by enabling critical personnel to respond quickly and efficiently to emergencies. As you can see, two-way radios improve collaboration among team members providing for an all-around more pleasant customer experience. Strong communication is at the heart of every successful hospitality establishment. 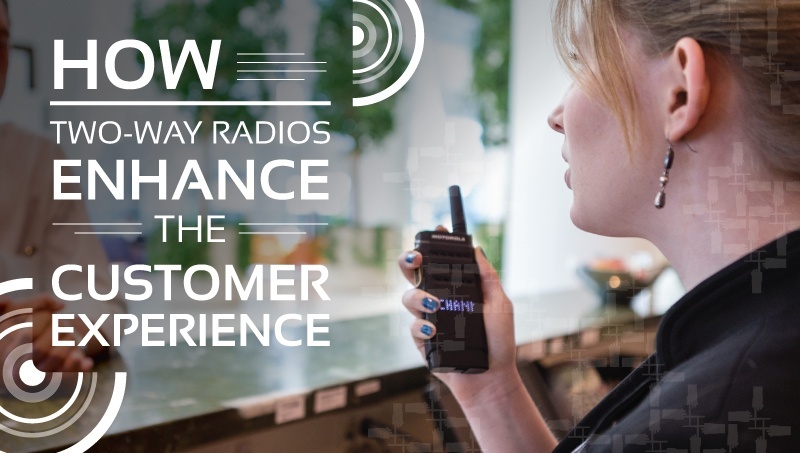 With two-way radios in use, your staff will be able to communicate professionally and rapidly to better serve your guests.